1) Toss the drumsticks in a bag with flour and seasoning. You only need to coat them with the mixture. 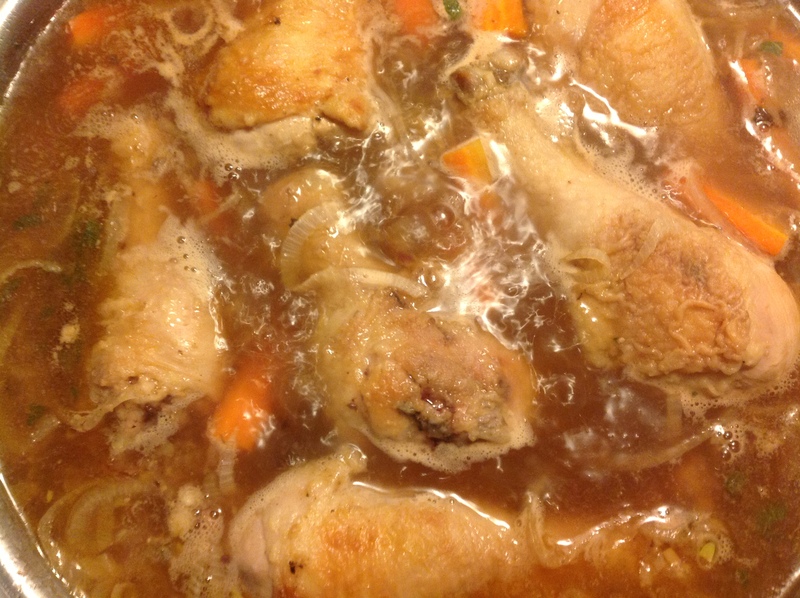 2) Caramelize the outside of the drumsticks in olive oil. The heat should be medium on average, but you can change it depending on your good judgment. Don’t worry about cooking the meat: just make sure the chicken’s skin gets golden brown on all sides. 3) Add the chorizo. Cook while you slice the vegetables. 4) Peel and slice the shallots into thin rounds. Do the same with the garlic cloves if you’re using normal garlic. If you’re using fermented garlic, mash into a paste. Add shallots and garlic into the pan. 5) Toss the ingredients in the pan if you suspect the chicken or the chorizo is sticking. Don’t let anything burn. When the shallots are clear and somewhat caramelised, deglaze the pan with the prosecco. Stir to blend the drippings in the bottom of the pan with the liquid. 6) Add water and carrots. Simmer for five minutes, then add lentils. 7) Cook over a med-low heat until the lentils have absorbed most or all of the liquid in the pan and are al-dente. If they’re too hard and there’s no liquid left, add more water. Salt to taste. 8) Bask in the glorious smell in your kitchen.